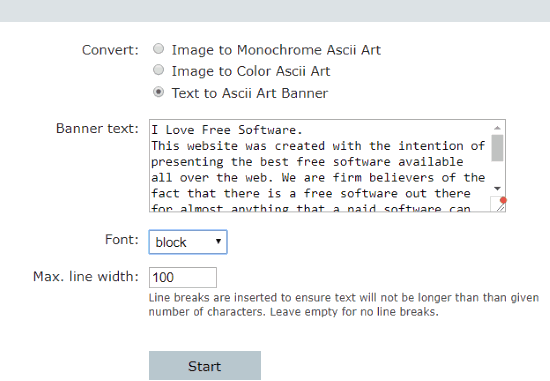 Here are 5 free online text to ASCII art converter websites. When you want to generate text-based visual art or banner message using the custom text, these websites are gonna help you a lot. All these websites let you convert text to ASCII art without any sign up. You just need to enter the text of your choice, set options (if available), and then generate ASCII art. The output can be copied to the clipboard easily and then you can add it in Notepad or any other places. Most of these websites use FIGlet fonts for text to ASCII art conversion. Apart from that, a few websites also let you convert text to ASCII art with all available fonts at once. 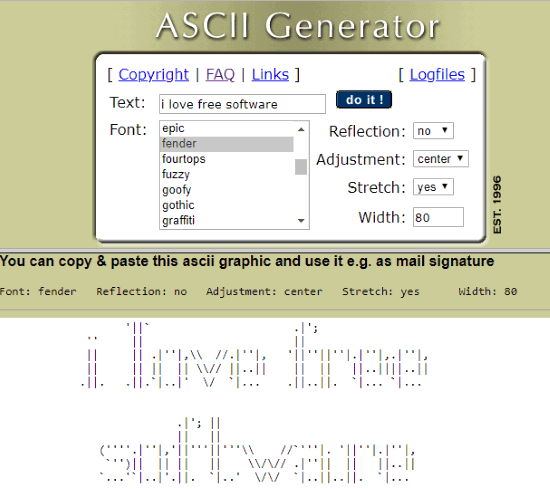 So, let’s start with first free online text to ASCII art converter. TAAG (stands for Text to ASCII Art Generator) website is simple but it comes with a very interesting feature. It lets you generate ASCII art from custom text with different fonts. The best part is you can preview the output ASCII art with all the available fonts with only a single tap. Once the text is converted to ASCII art, you can copy any output in one click and then paste in Notepad for later use. If you are not interested to convert text to ASCII art with all fonts, then you can also select a particular font from the drop-down list. It also lets you set character width and height with predefined options for ASCII art. I find this website quite helpful and therefore it deserves its place in this online text to ASCII art converters. 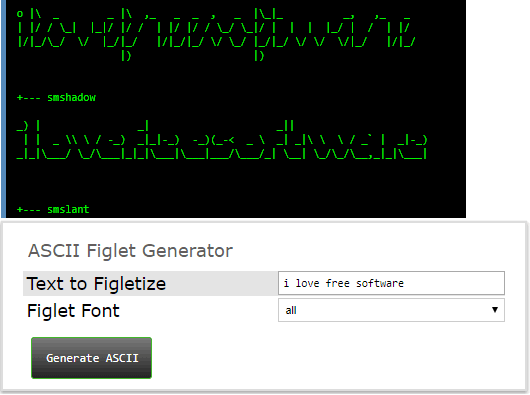 ASCII Figlet Generator, as its name suggests, provides FIGlet fonts to convert text to ASCII art. This handy online text to ASCII art converter also gives feature to preview ASCII art with all the available fonts in one go. All you need to do is enter your input text and, select “all” in drop-down menu and press “Generate ASCII” button. The ASCII art results are visible in the above part of its interface. You can also convert text to ASCII art for a specific font only. So, it’s your choice how you want to generate ASCII art. When the output is visible, copy it to clipboard and then paste in an email or anywhere else. 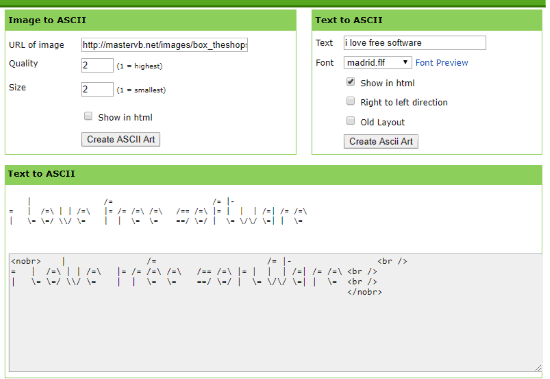 ASCII Generator (Homepage) is another simple website where you can generate some cool ASCII art with the custom text. This website uses FIGlet fonts to provide the output. All you have to do is enter the text of your choice, select a font, and press “do it!” button to see the output. The output is visible on the bottom part of its interface and it is generated with default settings. Although the output comes quite good with default settings, you can customize the options. It lets you show/hide reflection, add adjustment (center, right, or left), set width, and enable/disable stretch for ASCII art. Try the options and see how the output is visible. When you are satisfied with the output, you can copy ASCII art and paste it anywhere you want. Online Ascii Art Creator is an all in one text to ASCII art and image to ASCII art (monochrome or color ASCII art) maker website. Its text to ASCII art feature is quite useful. You can enter the input text, select an output style (bubble, block, mini, script, shadow, standard, etc.) and set maximum line width for ASCII text art. Set the options and use Start button to process the input text and get the ASCII art output. This website lets you save ASCII art as TXT file. You can also copy the ASCII art to the clipboard using the output preview. ASCII Art is the simpler online text to ASCII converter. It also lets you use different FIGlet fonts to create ASCII art from the input text. You can also preview the selected font before using it for text to ASCII art conversion. What makes it a bit special is you can view ASCII art in HTML format also and copy it to clipboard. An Old Layout option is also available but I have no idea what this option does. So, you may try this feature to figure out its use. Everything is pretty easy on this website. Just enter text, select a font, options (if needed) and press Create Ascii Art button. When the output is visible, you can select and copy it. All these websites are pretty awesome for text to ASCII art conversion. Still, the one that I find better than others is “TAAG”. I like its features to convert text to ASCII art for all the available fonts together, set width and height for output characters.